Some facts hide in plain sight. You don't notice them until you move them around a bit. Then suddenly, like some unscrambled Scrabble letters, there's clarity. Un-jumble the launch line-up for the Wii U and here's the fact that emerges: This fall, the Wii U is actually going to be a good console for... downloadable indie games. This is weird, folks. We're in Nintendo-Does-What-Nintendon't territory. Chasing Aurora This game has made the rounds at the Penny Arcade Expo where, back in 2011, we saw it on PS3. It's from Austrian studio Broken Rules, which previously made indie hit And Yet It Moves. Chasing Aurora's creators describe it as "a game about the dream of flight." It looks lovely. Out for the Wii U in November (presumably downloadable). Cloudberry Kingdom This game is made by some Americans who call themselves Pwnee Studios, but don't hold that against them. Back in May, they were scrounging for money on Kickstarter to make this thing. They pitched it as "the hardest platformer ever" and made their $20,000 funding goal. Now they're a Wii U launch game. See the trailer here? Think Super Mario World but wayyyyyyy harder. Out for the Wii U in November (presumably downloadable). 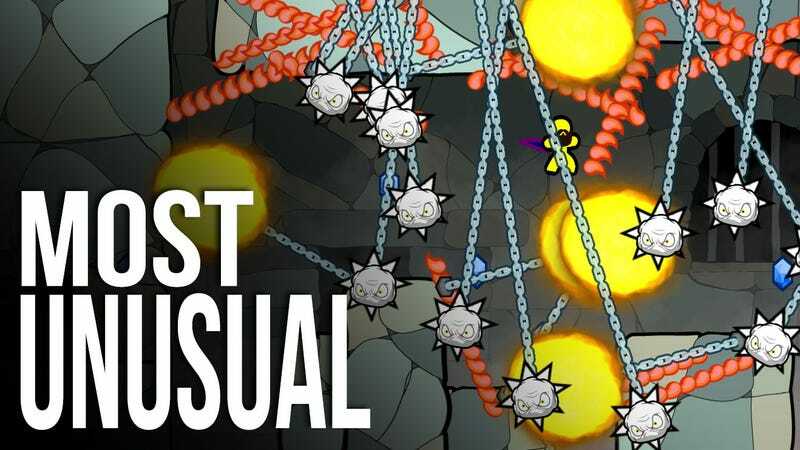 Little Inferno Take the friends who were involved in making cult favorite DS game Henry Hatsworth and the Puzzling Adventure and the beloved multi-platform World of Goo and let them make a new game. It's also coming to computers, but that's not the point here. Downloadable on the Wii U in November. Mighty Switch Force HD This is the console version of the 3DS game of the same name (sans the "HD"). It's a side-scroller/puzzle-platformer from the American studio WayForward Technologies. These folks mostly make licensed games, including the recent, good DS games based on the Thor and Aliens franchises. They occasionally turn out an original old-school game like this one. The trailer here is for the 3DS version. Downloadable on the Wii U in November. Nano Assault Neo This is a twin-stick shooter from the small German studio Shin'En. Is it the Wii U's Geometry Wars? Downloadable on the Wii U in November. Runner2: Future Legend of Rhythm Alien This sequel to BIT.TRIP. Runner is coming to a bunch of platforms, but given American development studio Gaijin Games' push for the series on the original Wii, it's fitting that the new one is also coming to the new Wii. Out for the Wii U in January (presumably downloadable). Toki Tori 2 The tiny Dutch development studio TwoTribes put out the first Toki Tori on the Game Boy Color in 2001. Finally, a sequel in 2012! It's a puzzle-platformer requiring the smart command of several animals. Downloadable on the Wii U in November. Trine 2: Director's Cut This is an extended version of a gorgeous side-scroller created by the small Finnish development team Frozenbyte. This new version contains the original game, the recently-released Goblin Menace expansion and a new exclusive level called Dwarven Caverns. It has online and local co-op. Downloadable on Wii U in November. This is not your ordinary line-up of (mostly) first-month releases for a major new gaming console. Launch day games like Nintendo Land, ZombiU and New Super Mario Bros. U are more typical. These are games with big names or are experimental new starts. They're on discs. They're from big companies. But a wave of indies? This has never happened before, not on a Nintendo console or any of the other majors. These indies are presumably all downloadable, which means that the vaunted 50-game launch window for the Wii U consists of a good number of non-disc games. That's not a scandal, but it also might not be what people are inferring when they hear about the system's 50-game launch line-up. It's a sign of how vital an appreciation of downloadable games are to the appreciation of new gaming hardware. The biggest oddity here is that Nintendo is positioning itself, early, as a supporter of downloadable indie games. Nintendo executives might tell you they always did and could point to the presence of games by most of the above developers that were sold on the 3DS or Wii's download shops. Technically, that's true, but the more accurate reality is that Nintendo has traditionally and primarily given heavy support to non-Western indies (read: Japanese indies whose games Nintendo has swooped in to publish). Nintendo has routinely failed to embrace the excellent innovations of young Western developers and allowed the release of indie games from American and European creators in only drips and drabs. For the first time, with this line-up, we're getting an actual wave—from the West. Shades of Microsoft and Sony's support for indies on Xbox Live Arcade and PlayStation Network. Several of these games support so-called Off-TV gameplay, which means you can play the likes of Toki Tori 2 and Nano Assault on a TV or on the Wii U GamePad's own screen. That's neat. A lot of attention has been paid on the Wii U's support for major third-parties. We've played into that at Kotaku, emphasizing how unusual it is that the Wii U will launch with an Assassin's Creed and Arkham game and eventually have a Mass Effect. Nintendo will tell you that that's a sign of extended big-game support from major third-parties. It's not clear if the system really has the power and appeal to court such games long-term. But the unreported and perhaps even more important twist here is this surprise support for indies. Getting more big-name, big-company games on the Wii U might make Nintendo's console a little more like an Xbox or PlayStation. But to win over the indies? If Nintendo actually loosens up and courts that crowd? Then they'd have a shot at being just a little more like Steam or the iPad. Given the flourishing of indies (see, oh… Minecraft!) this would be a good thing for Nintendo and for gamers. The creators of And Yet It Moves and World of Goo are making launch games for the Wii U? Hell yes. The release of Nintendo Land is still the main event in the Wii U's launch circus this November. That game is positioned to be the Wii U's Wii Sports. It's a showcase for the system's new controller, after all. But pay attention to another ring this fall: the one with all the indies in it. It could be the most exciting part of Nintendo's big Wii U show.